Thanks, that was very useful – I tried to do this years ago using the official R docuemntation, and quickly abandoned because it seemed too complicated for the use I had, using devtools, it seems super easy! Absolutely useful!! The official documentation and even hadley’s is too “deep” for what I want to do. Question: how would you save data? Use the save() function from base R to save as a binary object loadable with load(), or write.table() to write data to a plaintext file. Here’s a short article about including datasets in R packages; I found it helpful. Great post! Thanks a lot ! Cheers! WOW! excellent post! thank you so much for sharing! However if you feel intimidated to make a package, you can start by writing down your functions in an `.Rprofile` file. That’s true! Although that can make it hard for reproducibility, since you don’t always think to share your .Rprofile when you share code. But that being said, better to start somewhere! Thanks for sharing this. This is really great. This is great. With the help of this post, I’ve just successfully made my own package and I’ve started using github as well. Hi! Thank you very much!!! This post were extremely helpful & instructive (knowing what is GitHub). However, I noticed, from the icons, that you are using a mac. Using a windows computer, I tried following the same instructions, but the .r package couldn’t be created. Or may be it was due to some other reason. 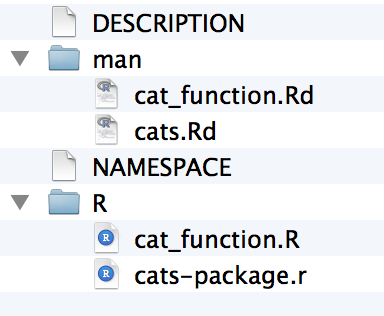 Luckily, at the end, I managed to create the package, through rstudio. Mixed what you instructed and someone else’s instructions. I wrote my first R package this weekend (convenience functions for geomorph using lab-standard settings) and your instructions made it so easy! Thanks. Ahhh how cool! Glad you stumbled upon it. Chirp chirp! I’ve successfully created a simple package. 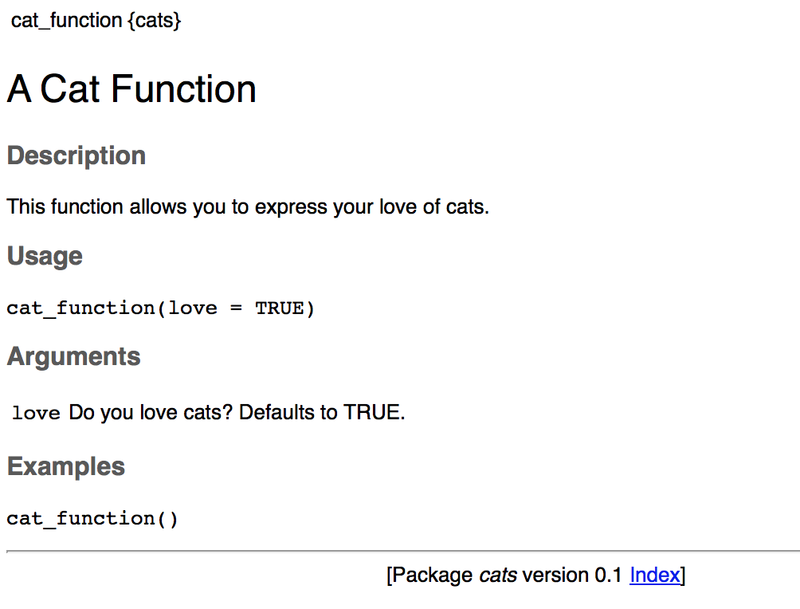 The package contains one function. I’d like to know how to automatically execute that function whenever the package is loaded? (instead of waiting for the user to call it. I learned how to do packaging with your tutorial. Thanks! This is so simple and exciting! I’ve written many R functions and never documented and recycled them. Think about all the time that I could have saved! Did I miss the part where you actually create the package? Very helpful. A couple of questions. 1) Where/how do you document the package rather than individual functions. Is this in the description file? How do you modify it? 2) Most function documentation has a “Details” section. how do we add that? I was wondering if anybody knows what Latex style to use to write a package’s reference manual. Thanks. By the way, for windows, one may need to do the following. Thanks! 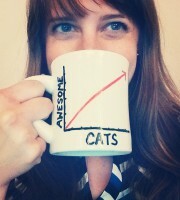 Bookmarked for future reference. Thanks for posting this up – helped me through the process! Hello and thanks for this primer on starting an R package 🙂 In order to gather candidate code to include, I was thinking about how one might find (almost) duplicate functions across all local .R files? After a few years of writing regular scripts for many different projects, they are scattered all across the harddrive for me. You could call your package ‘whiskr’. Or maybe ‘mousr’. Thanks, that was super-helpful. 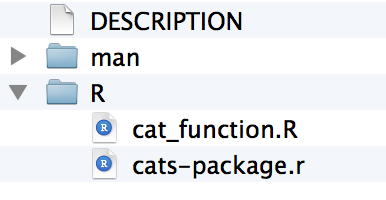 When creating the package, my ‘cats-package.r’ file isn’t appearing. Thus, after installing I have documentation on commands (?etc works great), but nothing is actually loaded. It makes a great glossary, but not very functional. Does something like this seem familiar, or simple?